Vancouver Public Pools, Lakes, Outdoor Swimming Holes, Beaches & More! Swimming is one of the best ways to exercise and one that almost anyone can enjoy, whether you're old, young, pregnant, mobile or working on physical therapy. Of course, swimming is also a great pleasure, and swimming outdoors in the summertime is one of the Top 10 Reasons to Love Summer in Vancouver. There are lots of choices for swimming in Vancouver, from year-round indoor facilities to fabulous summer outdoor pools, gorgeous lakes, and our breathtaking beaches. Use this Guide to Swimming in Vancouver to discover all the great options! For most of the year, swimming in Vancouver means swimming in Vancouver's affordable, indoor public pools. Vancouver's nine indoor pools are operated by the Vancouver Park Board and are open to everyone (including visitors; you do not need to be a B.C. resident to use these facilities). Check the pool schedules for public swim times, discount swims, and classes. Drop-in passes or multi-use packages are available for visitors wishing to take part in a class or have a swim. Tips: For serious training and variety (both offer multiple pools), the Vancouver Aquatic Centre in downtown Vancouver and Hillcrest Aquatic Centre near Queen Elizabeth Park are ideal. For babies and toddlers, Kilarney's pool is great because it tends to be a bit warmer. Long and luscious, Kits Pool is one of the top spots for swimming in Vancouver: it's Canada’s longest pool—almost three times longer than an Olympic pool--boasts a spectacular location on Kits Beach, and accommodates both serious swimmers and families with kids. In May 2018, the pool reopened with an extensive new $3.3 million facelift and improvements included repairs to the pool deck, the removal and replacement of the pool basin membrane, and new pumps that help to replenish and remove sea water. Kits Pool is one of five Vancouver outdoor public pools. Like Vancouver's indoor public pools, these pools are open to everyone (including visitors). Sadly, they aren't open year-round: Vancouver's outdoor pools are only open from mid-May through early September. ​Check the individual opening times but it's usually daylight hours only unless a special private event is taking place. Vancouver's world-famous beaches are incredibly beautiful...but the water isn't always so inviting--it's the Pacific Ocean so it can be cold! Still, on a hot summer day, you'll find plenty of people getting wet at Vancouver's Top 5 Beaches and the water tends to warm up as it gets closer to fall. If it's a really hot day you can head to Wreck Beach and ditch the swimsuit to go skinny-dipping at the clothing-optional beach. 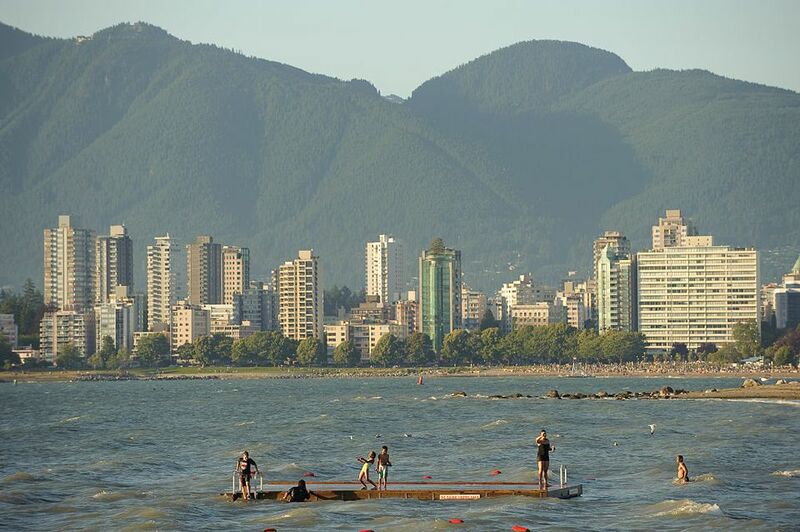 Tips: If you really want to swim--rather than just wade into the surf or splash around a bit--the best swimmers' beaches are Kitsilano Beach (Kits Beach) and English Bay Beach in downtown Vancouver's West End. In the summertime there's also a slide at English Bay that's within a short swim of the shore, so you can combine fun in the sun with your swim in the sea. It tends to appear around Victoria Day and stay until Labor Day and locals always see it as a sign that summer is finally on its way! Locals spend a lot of time in the summer swimming in lakes, swimming holes, and natural pools. Warmer than the ocean and often found in gorgeous forest and alpine settings, swimming in Vancouver's lakes and pools always lets visitors feel close to nature. Plus, it's fun! For more lake-swimming options at provincial parks, check out the Guide to Camping in Vancouver. Look out for official signs warning of any hidden dangers or water quality issues before you dive in--it's not usually an issue but there are some swimming holes that are shallower than they look and may have underwater obstacles.